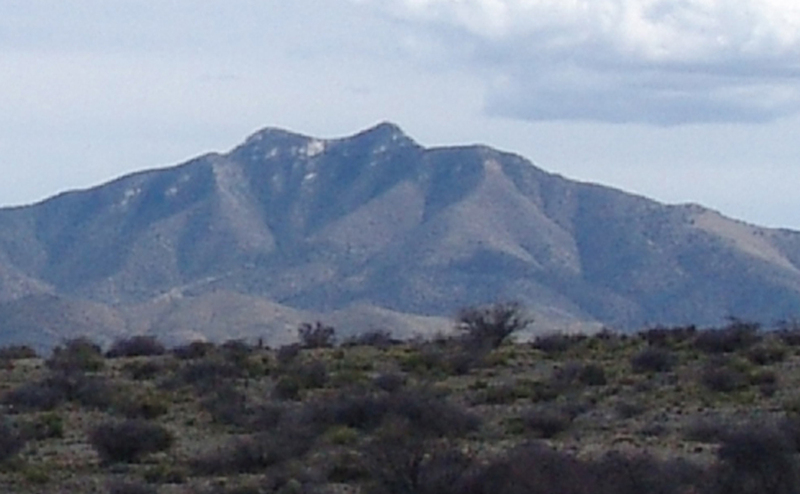 These mountains top out in their Mae West Peaks at 6726 feet above sea level. While a massive bed of Paleozoic sedimentary rocks form the core of these mountains, in their southeast corner intrusive granitic rocks called "Texas Canyon Quartz Monzonite" erode in spectacular rounded forms that make the Interstate 10 roadway portion of Texas Canyon famous. See Cochise College Geology for some excellent images of these erosions. The banner photo at the top of this page shows the Little Dragoons viewed from the north, on the Three-Links Road, in March of 2005. 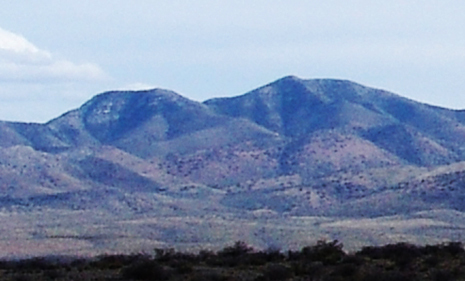 Below, closer views of the peaks showing snow deposits on the north-facing slopes, at left the easternmost, at right the more westerly Mae West Peaks. Click on each image to enlarge it. These mountains have been frequented by native American populations since very early times. In 1953 archaeologist Charles DiPeso reported findings of late-Pleistocene Clovis Hunter Culture projectile points in Texas Canyon near the Amerind Foundation Museum west of Dragoon, and in much more recent times the Butterfield Stagecoach Line, which linked St. Louis with San Francisco during the middle nineteenth century and ran through Texas Canyon, was memorably ambushed over a number of years by Chiricahua Apache bands who occupied the area. Below, a TOPO! map of these mountains. 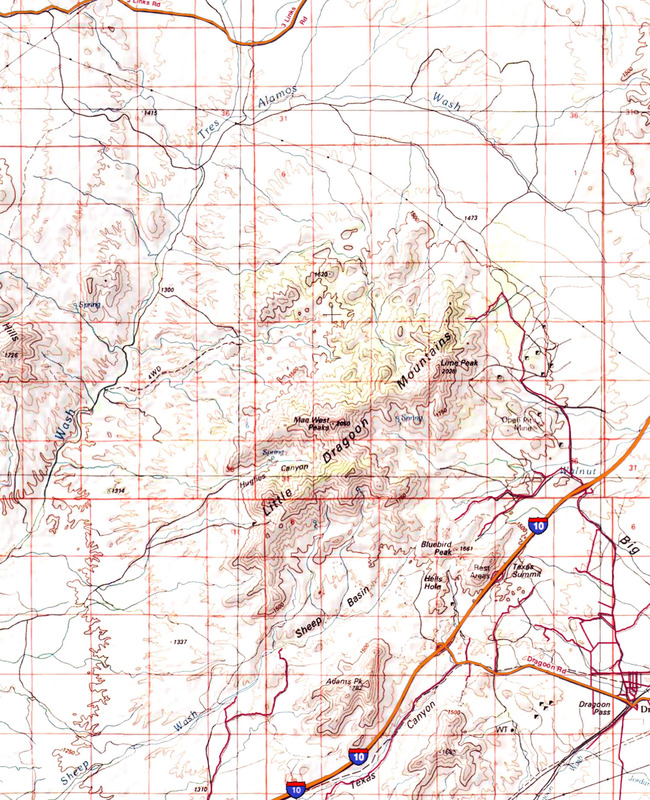 The Three-links Road referred to above runs along the top left portion of the map. and Texas Canyon is at the bottom just right of center. Note that the Tres Alamos Wash drains much of this mountain complex. See San Pedro River Valley, the "Middle San Pedro" portion.